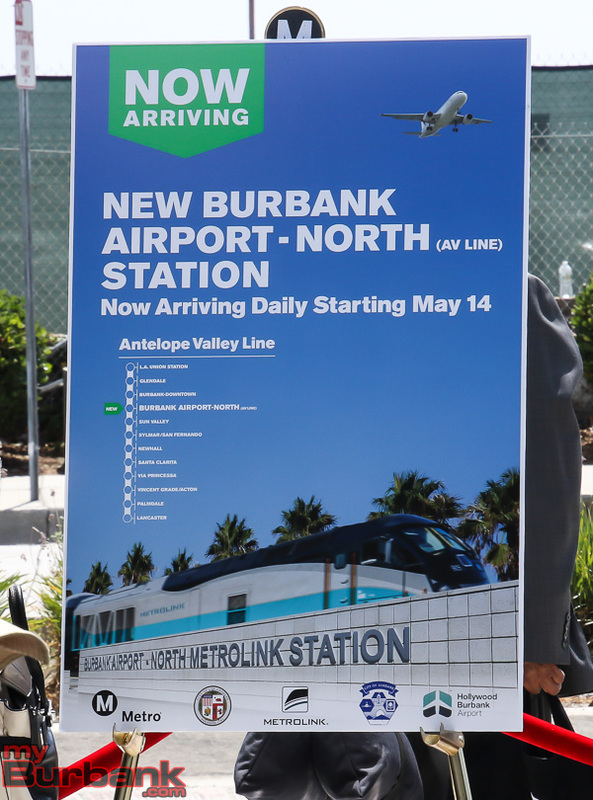 The Los Angeles County Metropolitan Transportation Authority (Metro), Metrolink and Hollywood Burbank Airport officials celebrated the completion of a new Metrolink Antelope Valley Line rail station that will connect travelers with the Hollywood Burbank Airport in the San Fernando Valley. 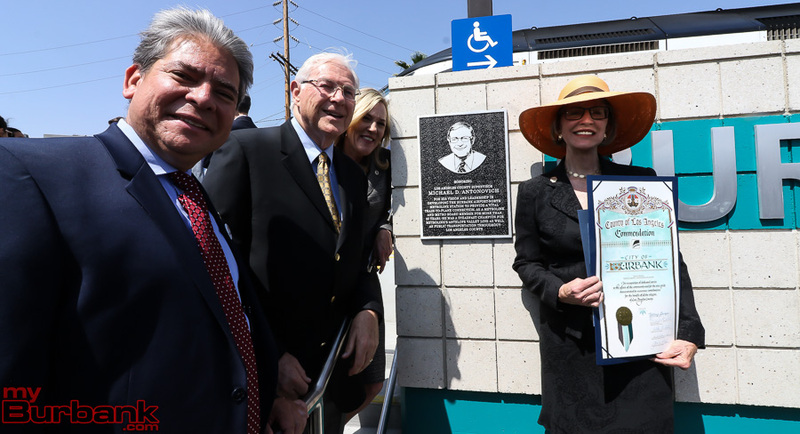 The station will officially open to the public on Monday, May 14. The station should help reduce vehicle trips on the I-5 freeway and roads in the many residential neighborhoods near the airport. 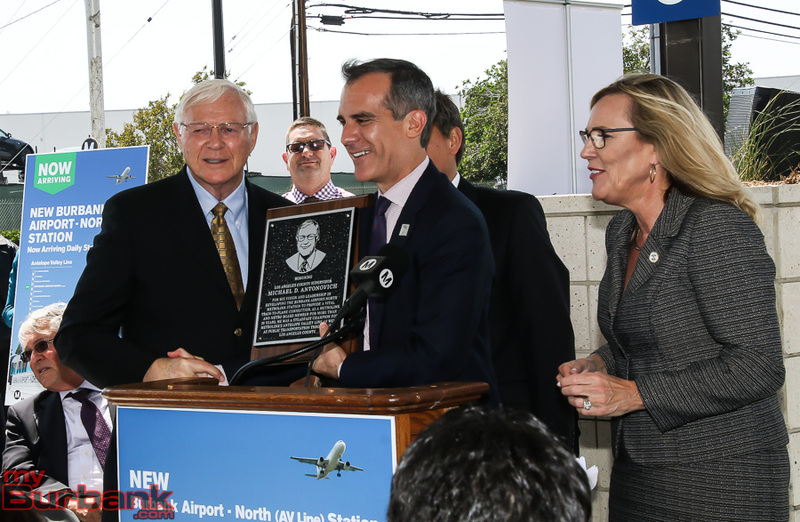 Air travelers will be able to seamlessly connect to and from the new station via a free shuttle operated by the Hollywood Burbank Airport. New station amenities will include rail ticket vending machines, benches, bike racks and LED display boards showing arrival and departure times for trains, buses, and planes. 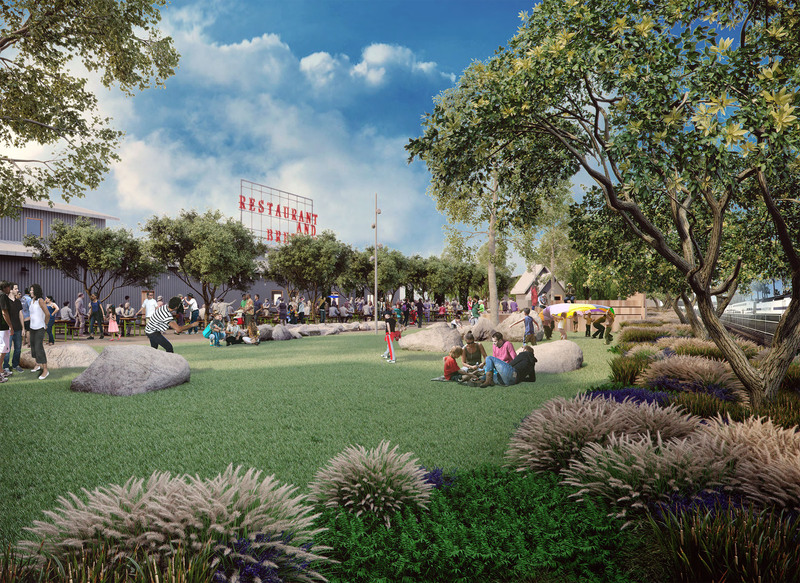 A pedestrian sidewalk and transit plaza will be built adjacent to the station platform and San Fernando Boulevard. 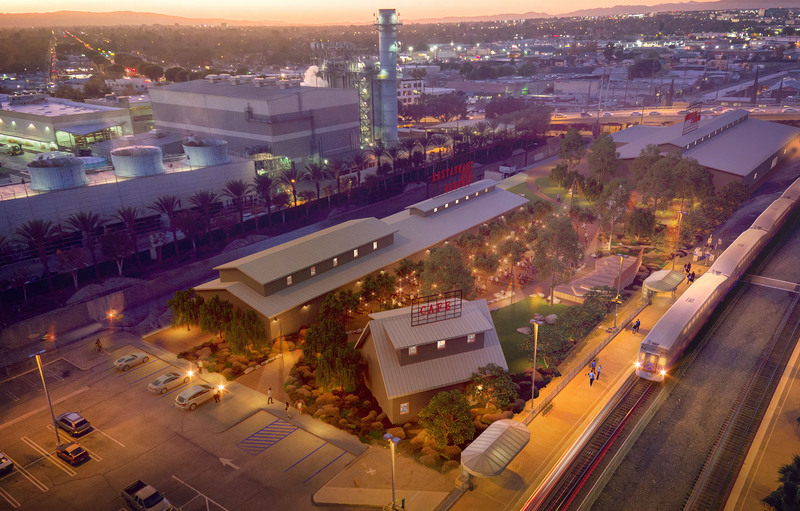 Located on the northwestern corner of Hollywood Way and San Fernando Boulevard between the cities of Burbank and Los Angeles, the new station will also be within walking distance of the planned airport terminal facility that will replace the current terminal, as well as a future proposed mixed-use development. 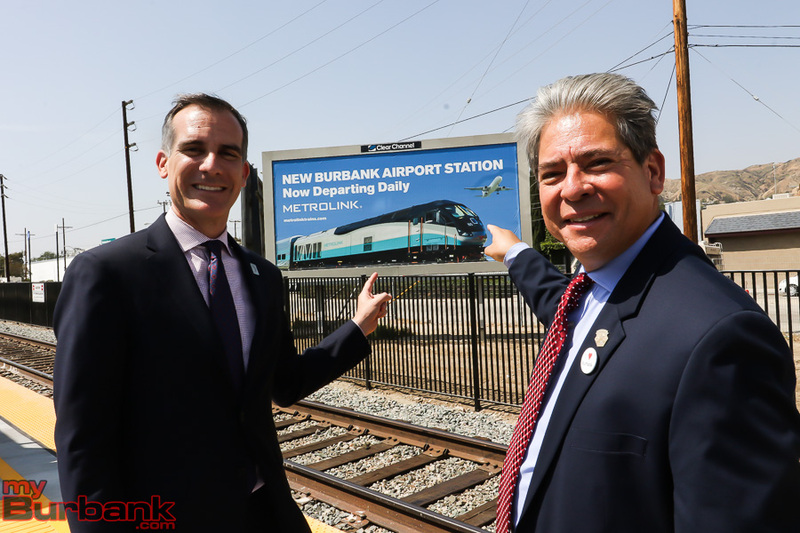 “Metro and its partners are making good on their promise to improve connections with airports countywide including Burbank, one the nation’s most convenient airports,” said Supervisor Kathryn Barger, a Metro Board Member. 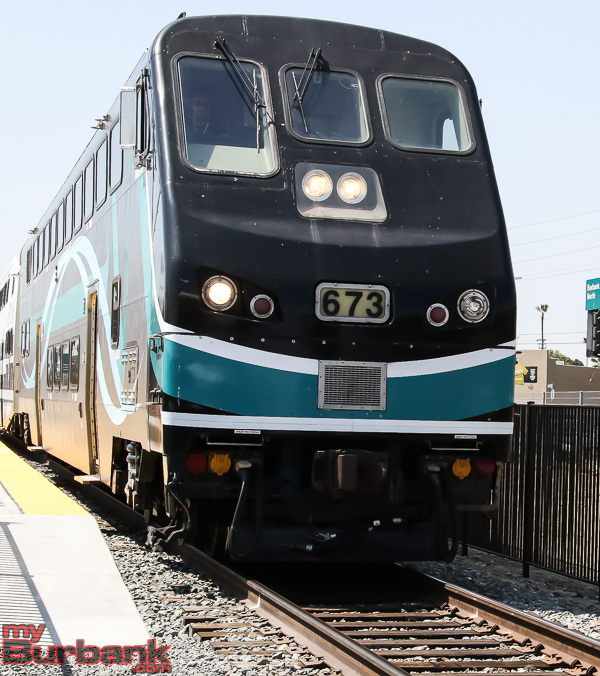 Metrolink’s Antelope Valley Line runs between Los Angeles Union Station, the Northeast San Fernando Valley, Santa Clarita, Palmdale and Lancaster seven days a week. 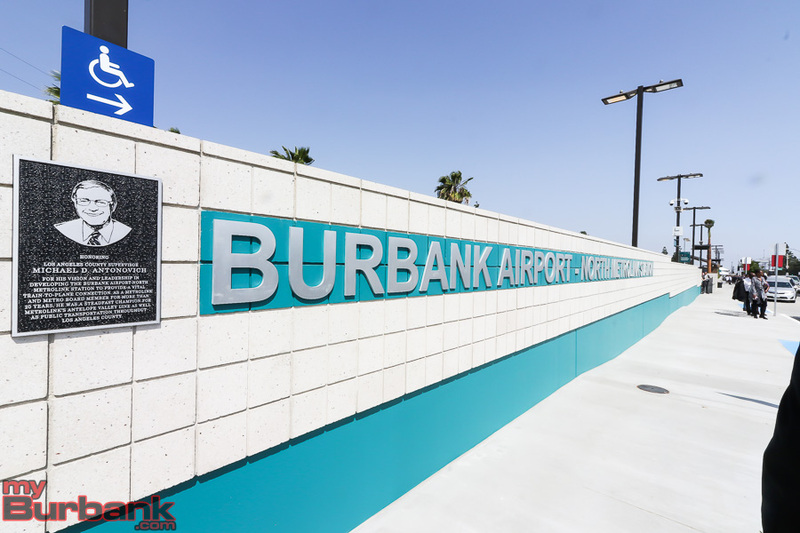 The station is the second to serve Hollywood Burbank Airport. 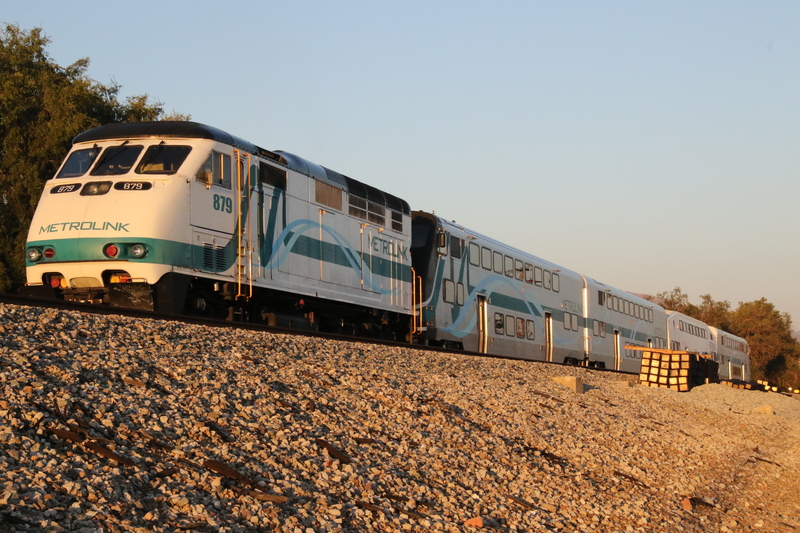 Metrolink’s Ventura County Line also provides a station stop on the other side of the airport with train service on weekdays only. Construction of the new station began in March 2017. The project was built by C.A. 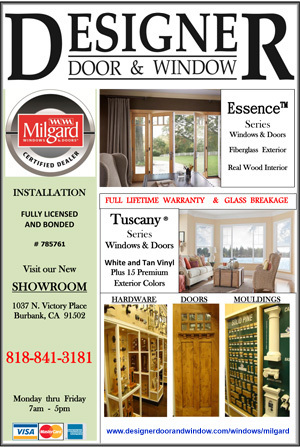 Rasmussen, INC., of Valencia, California. 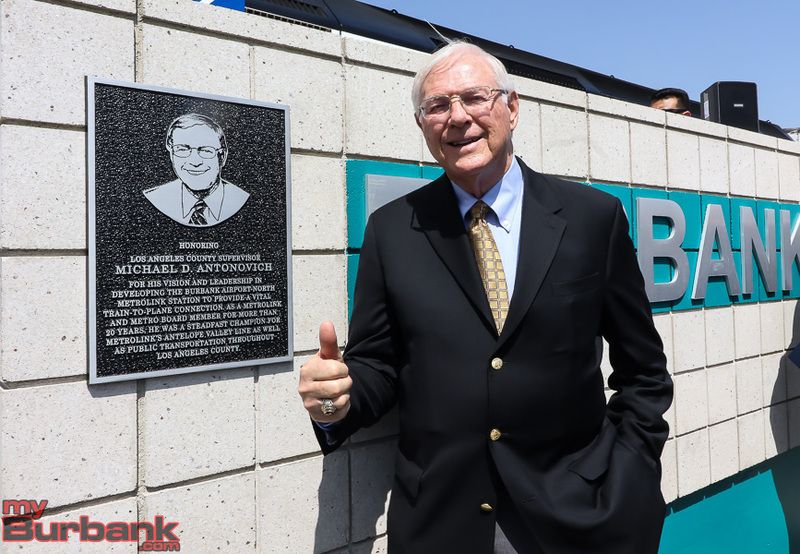 The $15 million project was delivered on-time and under budget. This entry was posted in News and tagged Metrolink, Plane to Train on May 11, 2018 by Staff. On Wednesday, May 2 at 2:00 p.m., Burbank Police responded to a call about a man possibly holding a gun near the Metrolink Station on Front St.
One of the first units on the scene was Burbank’s Air Unit and the Tactical Flight Officers in the helicopter saw the man who appeared to be holding a handgun aimed at two security guards. 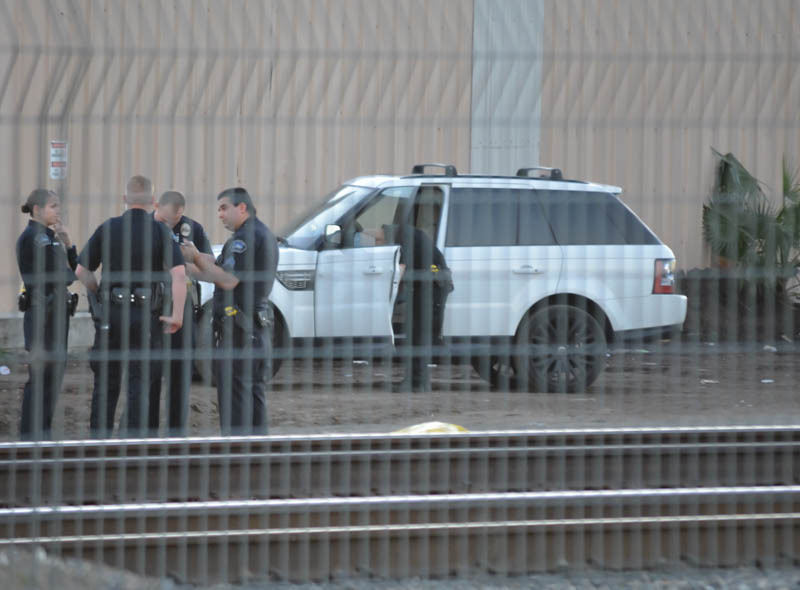 The suspect was seen getting into a minivan and leaving the Metrolink Station. Responding officers witnessed the van get on the I-5 freeway and pulled it over south of Alameda Ave. The minivan turned out to be an Uber. Police detained the driver and discovered a pellet gun inside the vehicle, which resembled a real handgun. The suspect has been identified as Anthony Barraza, 23 of Sun Valley. It seems that an argument between Barraza and Metrolink security guards over a smoking ordinance allegedly caused him to lash out and threaten them with the pellet gun. Before leaving the Metrolink Station, the suspect attempted to get into another vehicle by displaying the pellet gun at a driver. He was arrested and booked for attempted carjacking and criminal threats. 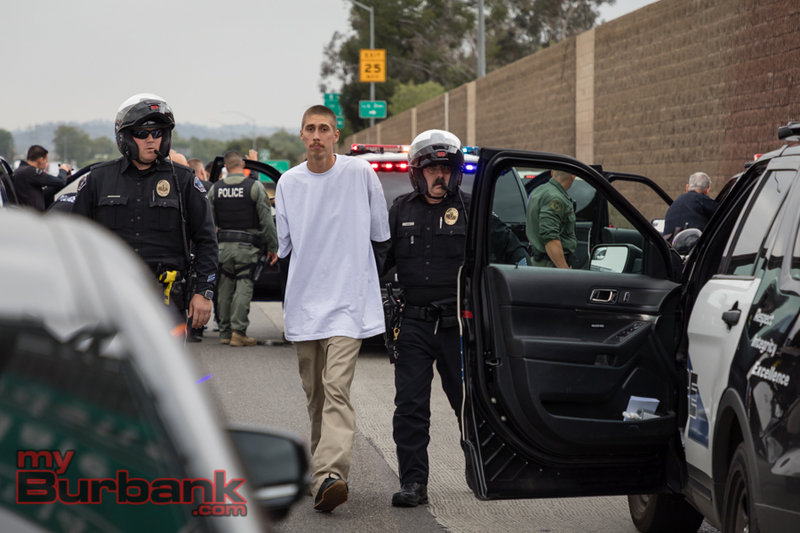 Barraza is currently being held on $100,000 bail and is due in court Friday, May 4. This entry was posted in Arrest Reports, Crime, Crime Report, News, Police and tagged Burbank Police, Carjacking, gun, Metrolink, police chase, safety, train station on May 3, 2018 by Timothy Mably. 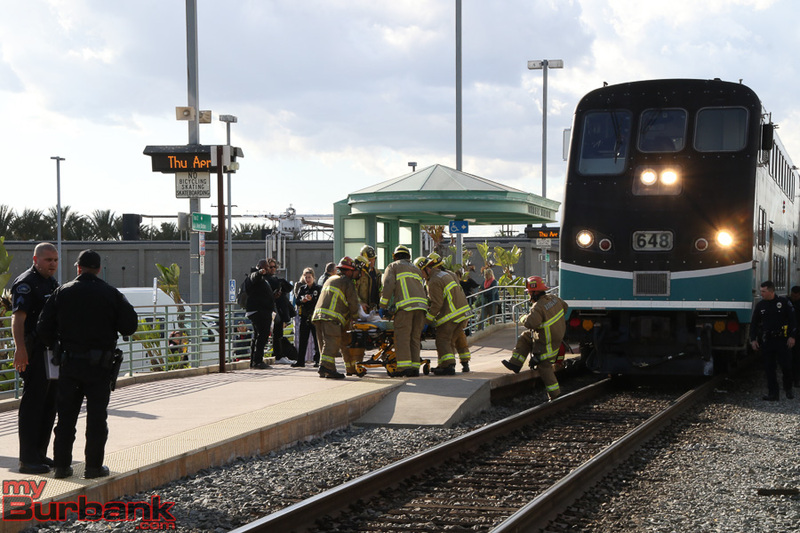 The Burbank Fire and Police Departments were called at around 5:00 p.m. to respond to a reported person who either jumped or fell in front of southbound MetroLink train number 150 as it was approaching the Burbank MetroLink Station. Firefighters located a male that appeared in his 20s or 30s beneath the main locomotive car on the west tracks. He had a pulse and was breathing. They loaded him upon a stretcher and transported him to a local trauma center. All trains coming and going from the station were stopped during the investigation. Many Burbank residents bound from downtown’s Union Station were stuck or had to find alternative transportation. Burbank police officers assisted the people who were at the station to buses waiting to take them to other destinations. Per a Metrolink spokesperson, no riders on the 150 train were injured in the incident and the investigation is still ongoing by law enforcement and MetroLink officials. 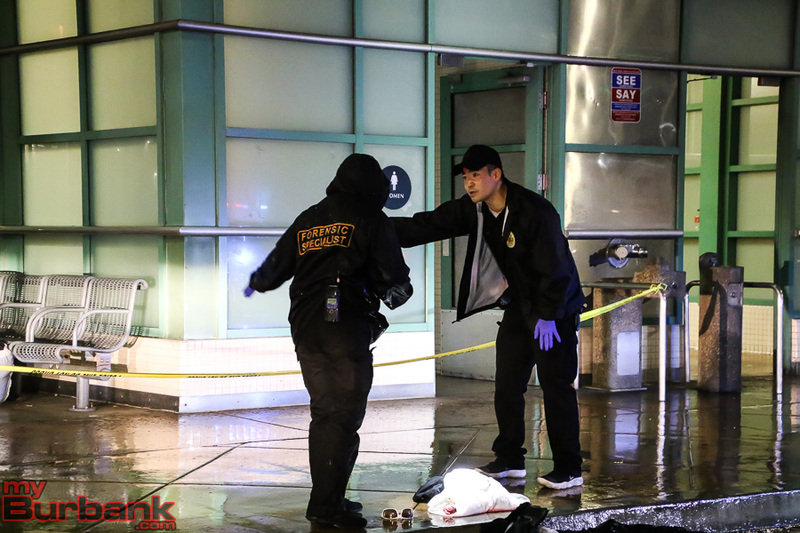 This entry was posted in News, Police and Fire and tagged Burbank Metro Station, Metrolink on April 20, 2018 by Staff. 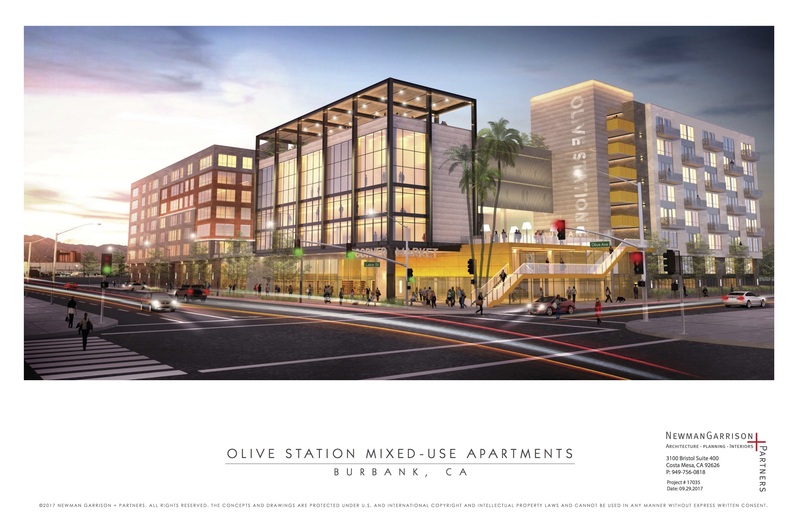 With a new influx of multi-use buildings heading to Burbank, one that is making a splash is the Olive Station development. The site of the future building can be located at the southeast intersection of Olive Boulevard and Lake Avenue. The land is currently owned by the Cusumano Real Estate Group. In total, the building will feature 327 studios, one bedroom, two bedroom, three bedroom, and four-bedroom apartments. The variety in apartments is meant to provide options in affordable housing to Burbank residents. Hired to design the building will be the award-winning architectural firm Newman Garrison + Partners. 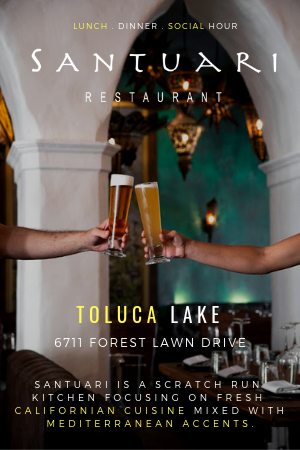 “We conducted an exhaustive search of all of the best design firms in this region, and went as far as to engage five different firms to produce concept drawings for the site, before finally selecting the firm of Newman-Garrison (NG+P) to design the project. And NG+P hit it out of the park. As is evidenced by the design submitted, and their plethora of design awards, Newman-Garrison will bring a new, cutting edge design to Burbank, and set the standard for all future mixed-use projects in the City. (NG+P) has completed projects in Spain, India, Russia, and in the Caribbean, as well as California, where they have designed some of the most recognizable southern California buildings in recent years such as West Park at Civita, The Ellington, The Q East, and the Dylan. To entice potential residents, plans for the building also include a an array of common spaces, which include a game room, a bocce ball course, a resort-style pool and spa with cabanas, outdoor dining/BBQ areas, fire pits, retail stores, an outdoor movie theatre, a media center, terrace amenities, a club/lounge area with a private wine room, and a state-of-art fitness center. Located at the ground floor will be a commercial grocery store. 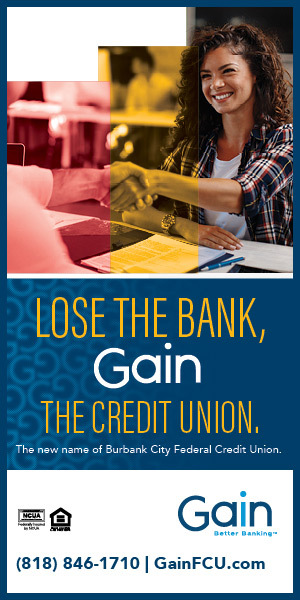 This entry was posted in Business, City of Burbank, News and tagged burbank real estate, cusumano real estate group, Metrolink, michael cusumano, nickelodeon, Olive on November 20, 2017 by Jacobo Lopez. 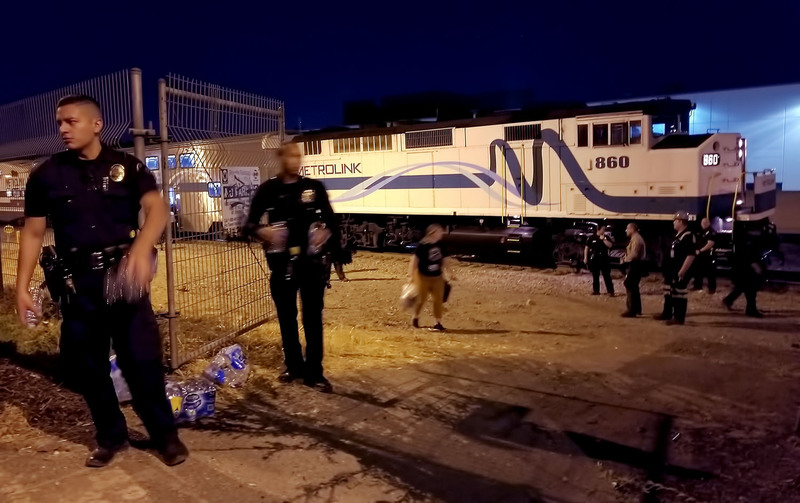 A woman was struck and killed by a Metrolink passenger train Thursday evening near the Downtown Burbank train station, located at 201 North Front Street. 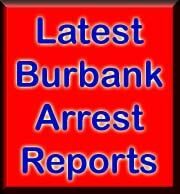 On Thursday, October 26, Burbank Police responded to the area shortly after 8:00 P.M. following reports of a pedestrian struck near the train platform. The Metrolink train, line number 225, was bound for Lancaster as a final destination and traveling northbound. 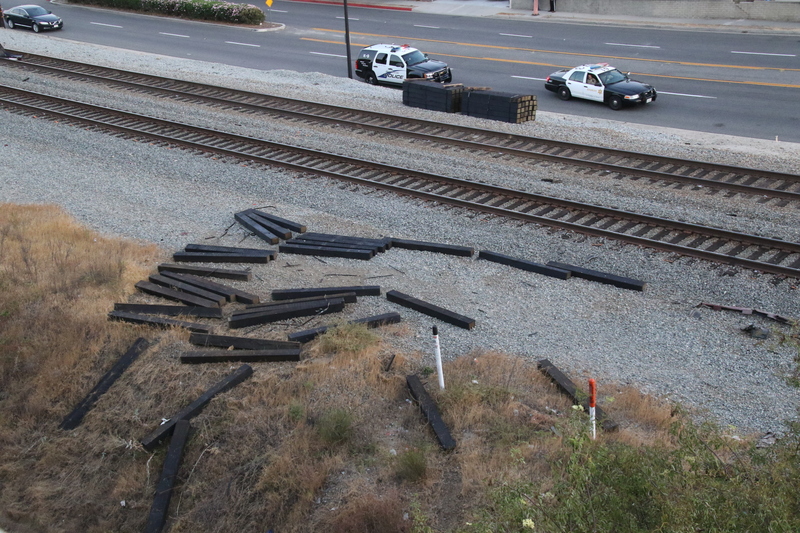 As the train approached the Downtown Burbank station, its engineer saw a female sitting on the railroad tracks. The engineer sounded the train’s horn to alert the woman, but she was fatally struck. 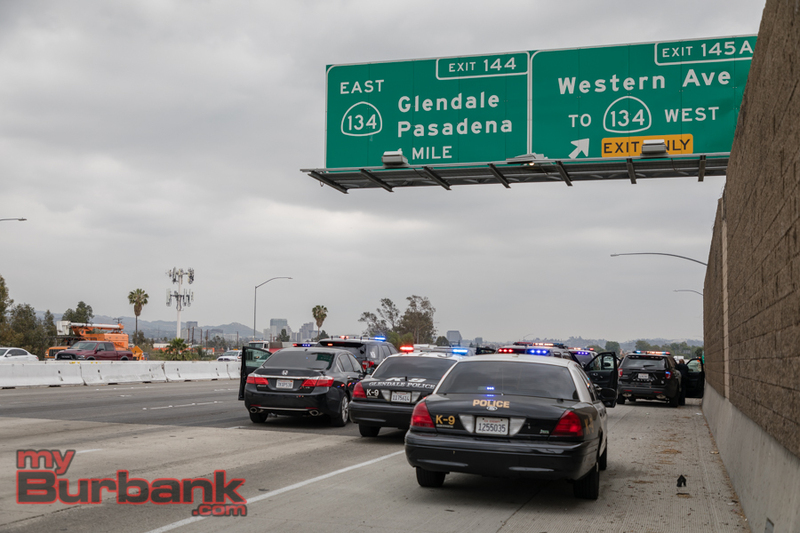 Burbank Police Detectives, Metrolink Officials, a Los Angeles County Coroner Investigator, and members from the Los Angeles County Sheriffs’ Department all responded to the scene. At the time of the incident, there were approximately 124 passengers and two crew members on-board the train. All passengers and crew members were interviewed and there were no injuries reported on the train. 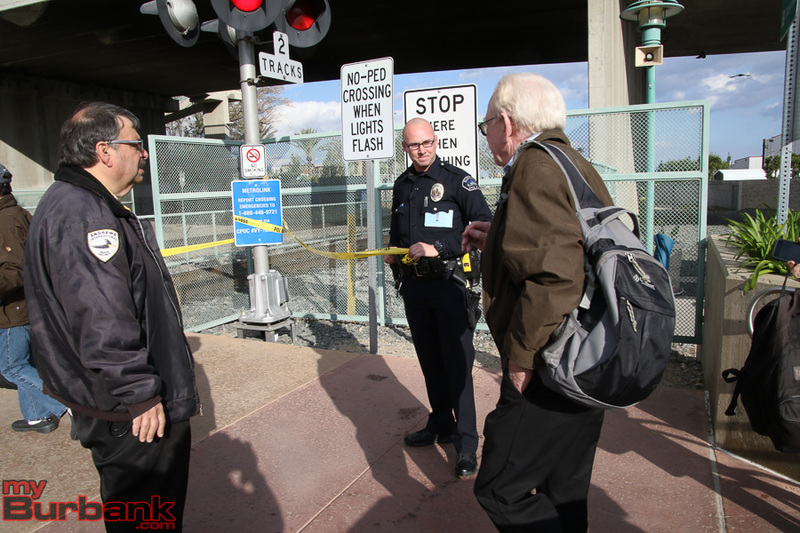 Several Metrolink trains were delayed while the investigation was being conducted. The victim has been identified as Lydia Savadjian, a 34-year-old woman from Glendale, California. It is not certain whether Savadjian’s actions were intentional or accidental. It is also not known if drugs and/or alcohol were factors in this incident. The investigation is ongoing. 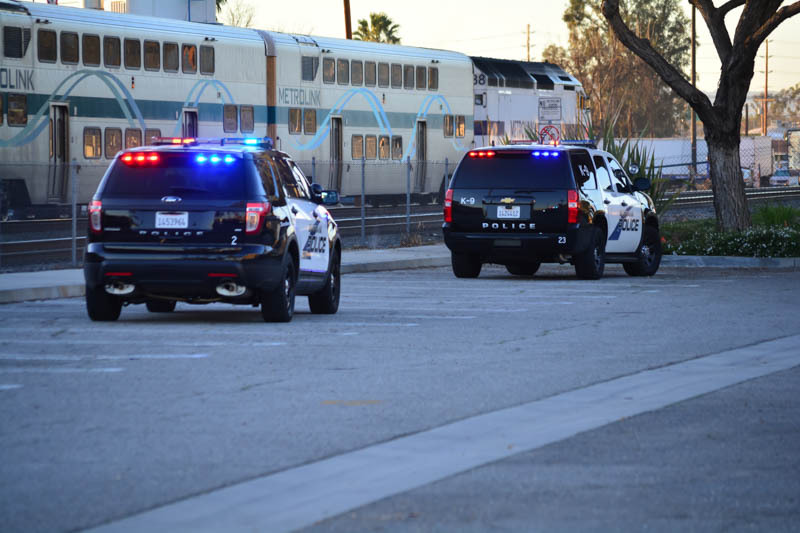 The Burbank Police Department would like to remind the public to always obey railroad crossing markings, warning signals, and control devices. Only cross railroad tracks at designated public crossing points, and when safe to do so. Railroad tracks, trestles, and equipment are private property. Never loiter or play on or near railroad tracks. Doing so can result in grave consequences, including serious injury and in many cases, death. This entry was posted in Fire, News, Police and tagged Burbank Police Department, Metrolink on October 27, 2017 by Staff. When: Four-week period beginning on Monday, October 9, 2017 from 10pm – 6am. Where: San Fernando Rd at N Hollywood Way (within the project workzone). > Possible traffic delays and slight increase in travel times due to posted lane closures. > Lane closures and re-routing clearly marked. > Emergency vehicle access will be maintained at all times. > For safety purposes, flaggers will redirect traffic when necessary. Metro apologizes for any inconvenience during this period and appreciates your understanding and cooperation. The station is being constructed within the existing railroad right-of-way with minimal impact on Metrolink operations. To enhance safety and enable construction activities, a full-lane closure of San Fernando Bl between west of N Hollywood Way and Greg Av has been in place. 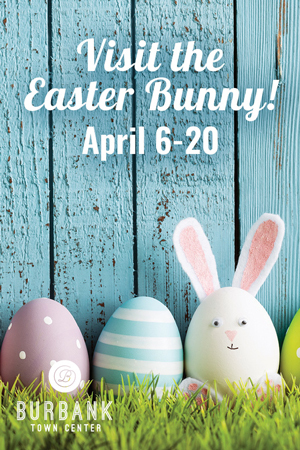 Construction activities can be expected Monday through Friday between the hours of 6am to 3:30pm; nighttime construction may also occur between 10:30pm to 6am, only if needed. The construction schedule is subject to change based on needs, weather and other operational factors. The contractor will limit heavy equipment use during nighttime hours to mitigate noise. Provisions are in place to minimize impacts to airport, emergency responder and business access. Efforts will be made to minimize dust and other construction impacts to the fullest extent possible. This entry was posted in News and tagged Construction, Metrolink on October 10, 2017 by Staff. 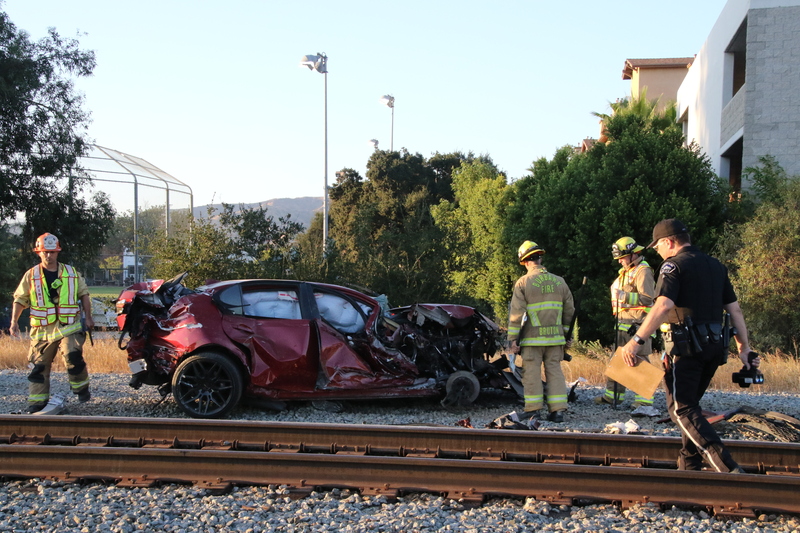 Burbank police are investigating the scene of an accident that occurred Tuesday, August 22 at 6:14 pm when a vehicle traveling southbound on Buena Vista struck a Metrolink train traveling westbound. When Burbank Fire Department’s Engine 14 arrived on the scene, they found the driver was already out of the vehicle. Paramedics treated the man and transported him to the hospital. According to Burbank Police Sergeant Derek Green, the man, who was in his 20’s, had non life threatening injuries. Police will request a test to see if the driver was impaired. 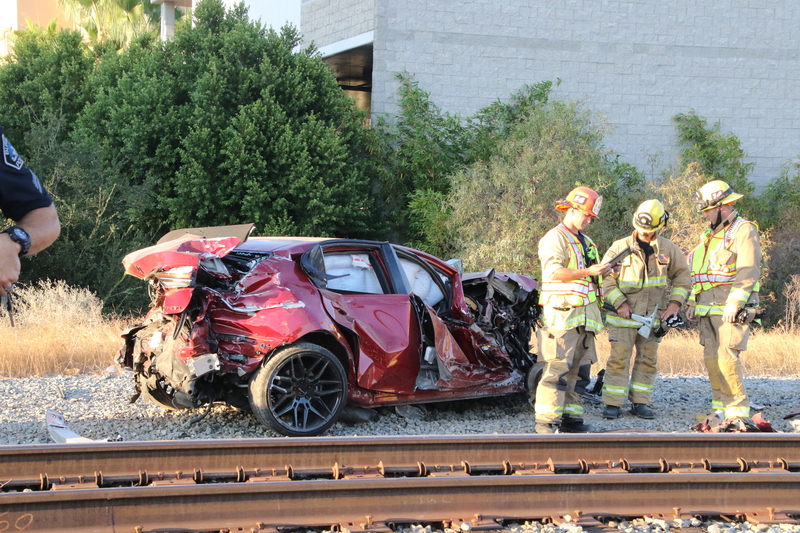 Witnesses report that the vehicle went around the railroad crossing gate before being struck by the train and being knocked about 200 yards down the track, coming to rest on the north side of the tracks. It also struck a pallet of railroad ties that were on the side of the tracks. Police went car to car to get names and addresses of all the passengers (over 300) that were on the train. No passenger reported any injuries. 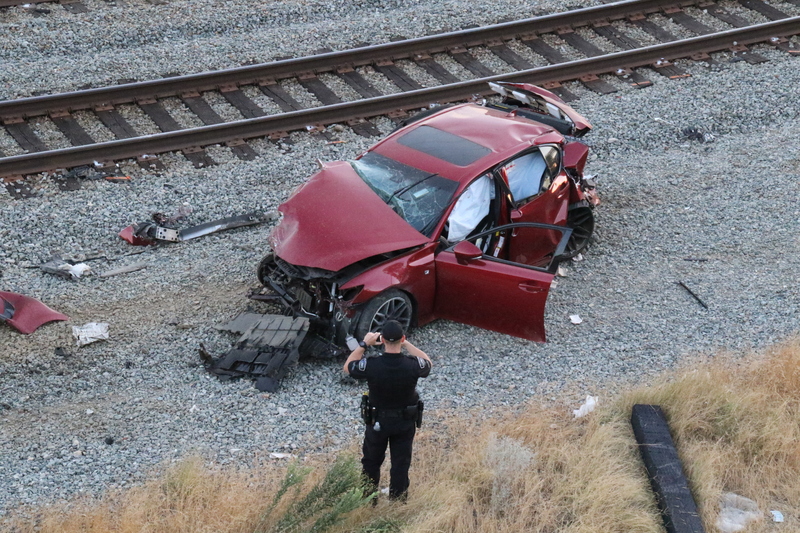 Police will now investigate using cameras at the scene along with a camera mounted on the Metrolink train as they recreate the accident that totaled the red Lexus. Police closed the intersection of Buena Vista and Vanowen for over two hours as they investigated the scene. Police gave the Metrolink team, headed to Ventura, permission to leave the scene at 8:30 pm. 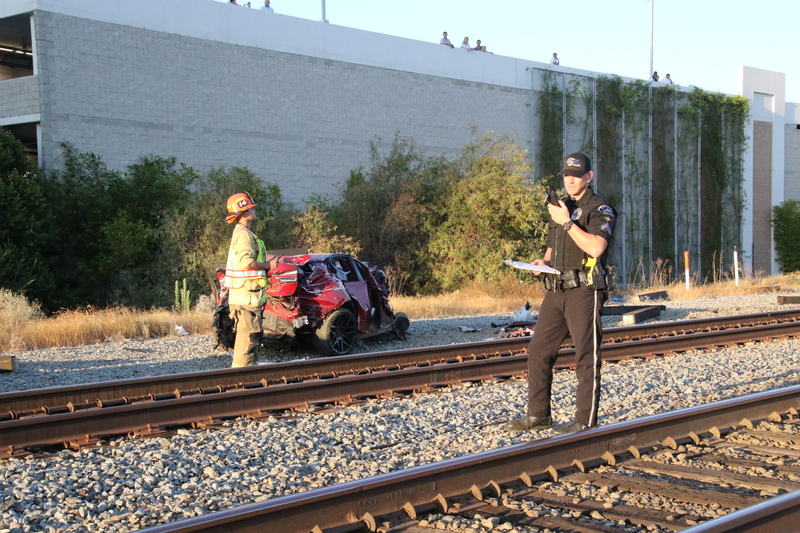 This entry was posted in News and tagged Burbank Police Department, Metrolink, Train vs Car on August 22, 2017 by Craig Sherwood. The Burbank Police Department can confirm the identity of the man who was killed in the train versus pedestrian collision on Saturday afternoon as George Gregory Plitt Jr.
Police report that on Saturday at about 4:05 pm, a male in his mid-30’s was struck by a southbound Metrolink Train, north of the Magnolia Boulevard Overpass in Burbank. Plitt was pronounced dead at the scene, by Burbank Fire Department Paramedics. Burbank Police Department Detectives responded and are investigating the circumstances surrounding this incident. Sgt. 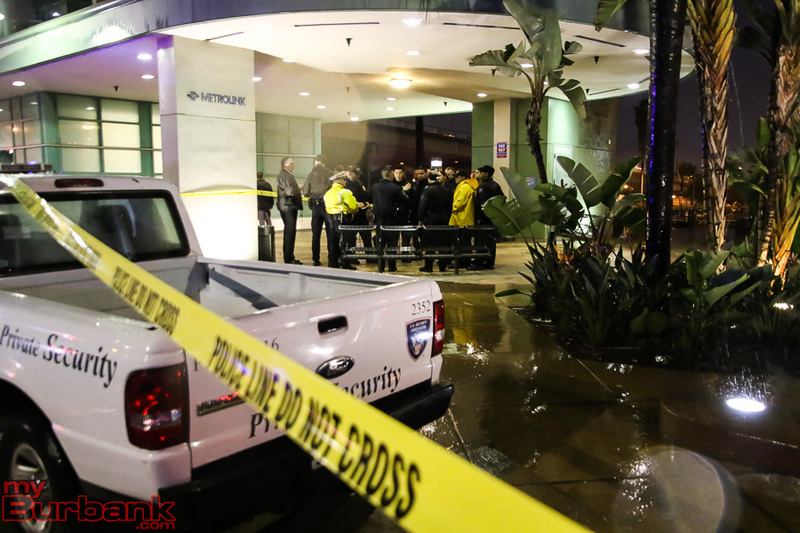 Scott Meadows of the Burbank Police Department told KTLA that they believed is was “likely not a suicide”. 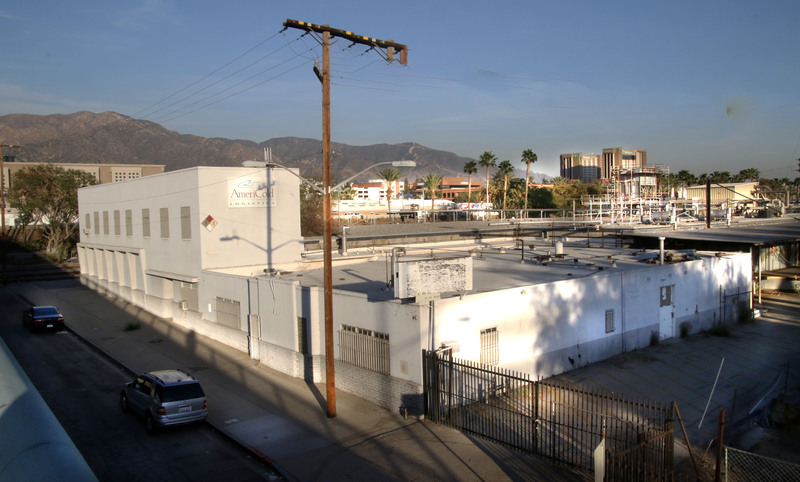 The Los Angeles Times reported that Plitt had been filming in the area at the time. A graduate of the United States Military Academy at West Point, Greg Plitt, went on to become a Captain and Ranger in the US Army. 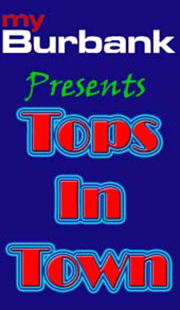 He is now self-employed in the entertainment and fitness fields, constantly busy as a motivational speaker, entrepreneur and model. This entry was posted in News, Obituaries, People, Police and tagged George Gregory Plitt Jr., Metrolink on January 19, 2015 by Craig Sherwood.